Acumen is a Literary Journal, placing an emphasis on poetry. Buy a single copy or subscription to Acumen magazine. 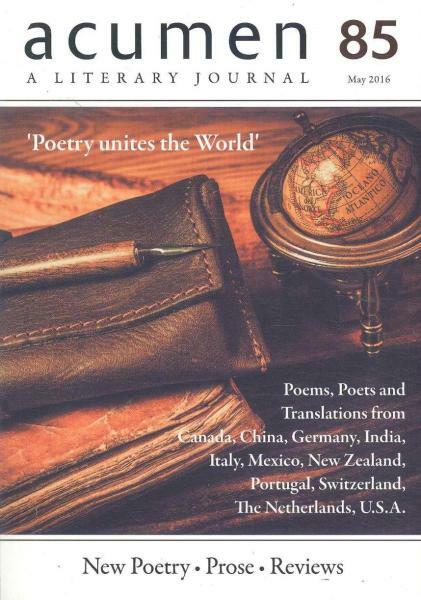 Started back in 1985, the magazine showcases poetry, reviews and articles by both well-known poets and those just beginning their poetic writing. This is a poetry magazine edited by its readers and an appreciator of poetry. It prints poetry of all genres and a wide range of articles including interviews, memoirs, satirical pieces, appraisals and even re-appraisals of unfashionable poets from the past. Each issue contains around fifty new poems set within a prose framework where, we hope, each reflects from the other. The Reviews’ Section covers books from mainstream publishers of poetry, but also gives plenty of space to books of poetry produced by small independent presses.